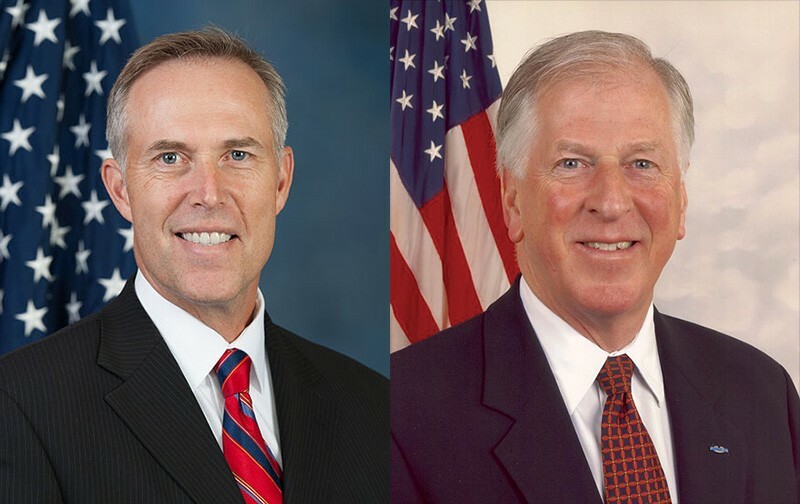 It's an election year, and though there's a newly minted, media-friendly meme popping up on the TV talking-head shows and politics blogs—Obama's war on ISIS will affect the midterm congressional races—that's not an issue for North Bay Democratic congressmen Jared Huffman and Mike Thompson (shown, left to right). For all intents and purposes, both men are running unopposed, despite nominal opposition. The Center for Responsive Politics reports that both incumbents face opponents who have yet to raise a single dollar. So while the North Bay lawmakers' seats may be safe during the midterms this fall, the politics of ISIS-ISIL, and President Barack Obama's speech last week, are very much in play this week as Congress starts to wade into the Obama strategy. Debriefer shot a bunch of questions over to Huffman and Thompson's press offices, asking for their view on Obama's strategy—and whether it flew outside the bounds of his authority as commander in chief. The two men represent putatively polar ends of the Democratic Party: Thompson is a member of the 15-strong Blue Dog Coalition of fiscally conservative Democrats, an organization that also emphasizes a robust national security posture. Huffman is a member of the fiscally liberal Congressional Progressive Caucus. Asked for clarity on his view of Obama's plans for ISIS, Huffman's office directed Debriefer to an op-ed he published in Monday's Press Democrat. We asked the same of Thompson's office, and they emailed Debriefer the statement Thompson made after the Obama speech. If we're in a parsing mood, and we are, the big difference between the Blue Dog Thompson and the progressive Huffman is over questions of "authorization" or a more loosely worded call on Obama to act with the "cooperation and involvement" of Congress. Huffman demands authorization through a congressional vote. He agrees ISIS must be stopped, but opposed the strategy outlined by Obama. "I share his desire to destroy this group," Huffman writes. "However, I believe the strategy outlined by the president—bombing in Iraq and Syria, supporting Kurdish and Iraqi partners on the ground, and recruiting, vetting and arming moderate Syrian rebels—falls short in several key respects." "First, we must restore the constitutional safeguard of wars being authorized by Congress. President Obama should obtain congressional authorization." For his part, Thompson's statement was decidedly more full-throated in its endorsement of Obama's underlying strategy for dealing with the ISIS-ISIL ghouls: "President Obama laid out a comprehensive, multilayered strategy to combat the ISIL terrorist group and diminish its capacity to operate," he writes, adding that "with the cooperation and involvement of Congress and a broad, international coalition of Muslim and Western countries, the U.S. should move to diminish ISIL, degrade their organizational capabilities . . ."
"Consultation with Congress is definitely important to Mr. Thompson," says spokesman Austin Vevurka via email, "and that's why he stressed in his statement that action should be taken "with the cooperation and involvement of Congress." Obama did consult with Congress before he started dropping bombs in Iraq a few weeks ago. He did not get their authorization, however, and said he didn't need it.